Just back from trip to Mallorca where I took hundreds of pictures, mostly plants. Of course there is a big backlog of work for me to catch up on now I'm back - that's the price of being self-employed. So I don't know when I'll get round to sorting out the Mallorca pics. In the meantime I'll just carry on the Nature Notes without them, starting today. I'll just include a few brief observations I made during the UK part of the journey. Stayed overnight in the vicinity of Gatwick Airport, 16-17 March, and noticed that in general the vegetation was well ahead of Skye, with several inches of growth on things like Nettle and Cow Parsley. Plenty of Celandines in flower and also White Dead-nettle flowering. 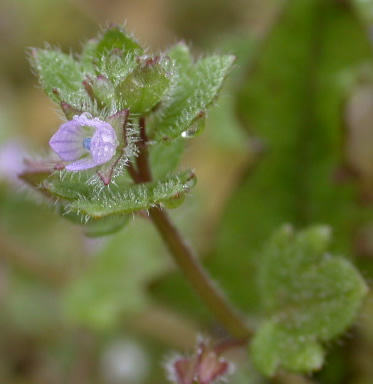 Took this picture of Ivy-leaved Speedwell (Veronica hederifolia) on Horley railway station, for which I was questioned by the security staff. They were satisfied with my explanation, which went "I'm from Skye". Passing through Gatwick on the way back, on 30 March, noticed occasional Cow Parsley and Dog's Mercury with flowers, though the vast majority of both did not yet have any. Cuckoo Flowers and Wood Anemones were out in force, and there were more White Dead-nettles. Of trees, Ash was still dormant but Elder had leaves well out, and Hawthorn had mostly just green buds, but some were showing leafage. In Inverness the next day, the Cow Parsley was not as advanced as at Gatwick but the Elder and Wood Anemones were. Celandines were at their peak flower density in places. And here is some Red Dead-nettle. There's nowhere like Inverness for getting close enough to common birds to photograph them with an ordinary camera. Here's a Wood Pigeon pecking about on the grass beneath the trees on the Ness Walk. And here are some Tufted Ducks. Drake on the left, duck on the right. I even managed to get some pics of the normally shy Moorhen. Finally, poor record shots of a Jackdaw and a Lesser Black-backed Gull in the River Ness. The latter is normally a summer visitor. In the foreground of the Jackdaw pic is a Black-headed Gull, which is by far the most numerous bird in Inverness and also the most approachable, which may be why I never bother to take pictures of them.